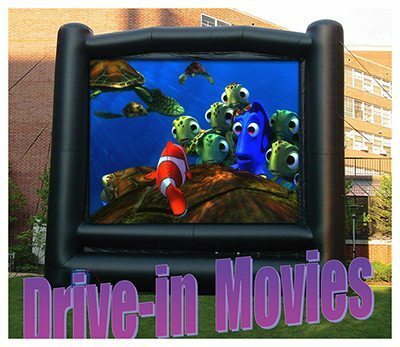 Relive the good old days of the Drive-in-Movies with our 18’x24′ (viewable screen) inflatable movie screen. Projects from the rear of the screen for more audience room! Setup almost anywhere: On Grass, Parking Lots, Dormitory Quads, Field Houses, Student Unions, Pool Areas, Gymnasiums, etc. Front and rear digital video projector. High powered professional audio system. Music videos for before movie and at intermission. Cartoons also available. Client provides the movie. *Also a 10 1/2′ x 14′ viewable inflatable movie screen available for indoor or outdoor settings.